1 2 "METALLICA: 2009 'World Magnetic' Concerts From Quebec City To Be Released On DVD". Blabbermouth.net. September 20, 2012. Archived from the original on November 22, 2012. Retrieved November 22, 2012. 1 2 3 "METALLICA: 'Quebec Magnetic' DVD, Blu-Ray Artwork Unveiled". Blabbermouth.net. October 22, 2012. Archived from the original on November 22, 2012. Retrieved November 22, 2012. ↑ "METALLICA Takes Ownership Of Its Masters, Launches New Record Label". Blabbermouth.net. November 30, 2012. Archived from the original on December 1, 2012. Retrieved December 1, 2012. ↑ "METALLICA: 'Quebec Magnetic' DVD Teaser Trailer Available". Blabbermouth.net. November 19, 2012. Archived from the original on November 22, 2012. Retrieved November 22, 2012. 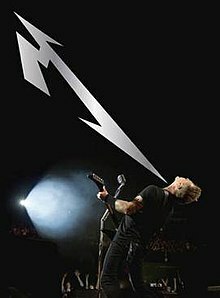 1 2 "Metallica: 'Quebec Magnetic' DVD First-Week Sales Revealed". Blabbermouth.net. December 21, 2012. Archived from the original on December 21, 2012. Retrieved December 21, 2012. ↑ "ARIA Top 40 Music DVD" (PDF). The ARIA Report (1192): 23. December 31, 2012. Retrieved February 27, 2013. ↑ "Austria Top 40 – Musik-DVDs Top 10 21.12.2012". Austriancharts.at (in German). Hung Medien. Retrieved February 27, 2013. ↑ "Ultratop 10 Muziek-DVD". Ultratop (in Dutch). Hung Medien. Retrieved February 27, 2013. ↑ "DVD Music Top 30". GfK Dutch Charts (in Dutch). Hung Medien. Retrieved February 27, 2013. ↑ "Suomen Virallinen Lista – Musiikki DVD:t 50/2012". Musiikkituottajat – IFPI Finland (in Finnish). Retrieved February 27, 2013. ↑ "Album – Metallica, Quebec Magnetic [DVD]". Charts.de (in German). Media Control . Retrieved February 27, 2013. ↑ "MAHASZ – Magyar Hanglemezkiadók Szövetsége". Mahasz (in Hungarian). Retrieved January 5, 2013. ↑ "Classifiche: Archivio – DVD Musicali". FIMI (in Italian). Archived from the original on March 5, 2016. Retrieved February 27, 2013. ↑ "Top 20 DVD Musical" (PDF). PROMUSICAE (in Spanish). Media Control GfK International. Retrieved February 27, 2013. ↑ "Swiss Charts – Music DVD Top 10 23.12.2012". Swisscharts.com. Hung Medien. Retrieved February 27, 2013. ↑ "2012-12-22 Top 40 Music Video Archive | Official Charts". Official Charts Company . Archived from the original on May 21, 2014. Retrieved February 27, 2013. ↑ "Ultratop 10 DVD Musicaux". Ultratop. Hung Medien. Retrieved February 27, 2013. ↑ "Musik DVD Top-10". Hitlisten.nu (in Danish). IFPI Denmark. Archived from the original on April 12, 2013. Retrieved February 27, 2013. ↑ "Sveriges Officiella Topplista". Sverigetopplistan (in Swedish). Archived from the original on December 26, 2015. Retrieved February 27, 2013. Search for Metallica Quebec Magnetic and click Sök.